This post may contain some affiliate links, which means I’ll make a little money on anything you choose to purchase. But of course, I only recommend my absolute favorites to you. Thank you for supporting the brands that make Hulaland possible. 1.Visit the Seahorse Farm in Kona. It’s not everyday that you get to hold a seahorse! The Ocean Rider Seahorse Farm in Kona breeds seahorses and is making great strides in their conservation efforts. 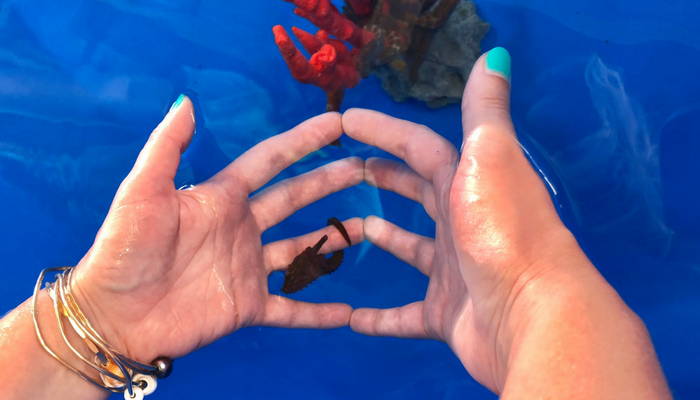 The fee you pay to tour their facilities goes towards research and conservation and not only do you get to see lots of species of seahorses, but at the end of the tour you submerge your hands into a tank and let one of the seahorses wrap around your finger. This seriously was one of the highlights on my trip to the Big Island. 2. Hike to the green sand beach. The trip isn’t easy but the journey to get to the famous green sand beach is well worth the adventure! 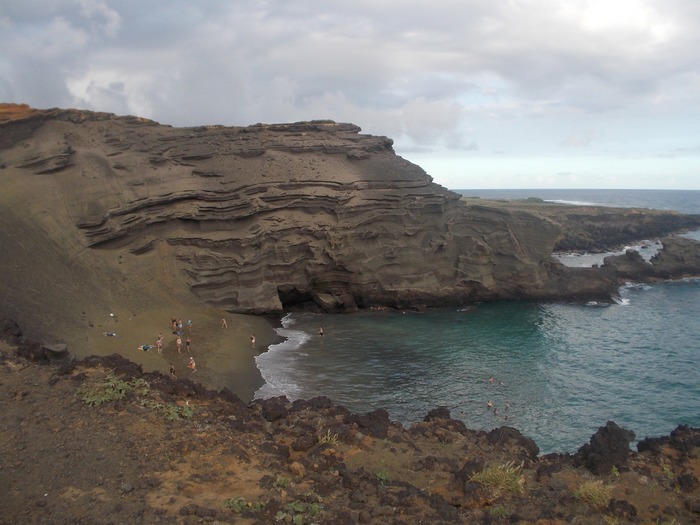 Located near the southern most point, the spectacular green sand beach (it gets its color from peridot deposits) is only accessible by a two-hour hike. If you get lucky, there may be locals hanging out in the parking lot offering to shuttle tourists across the rocky terrain in their ATVs and trucks (for a small fee of course). Take them up on their offer-it’s well worth the cost! 3. Take a helicopter tour over an active volcano. This is one of the only places in the world where you can see an active volcano up close and it’s a sight not to miss! The lava can be seen by boat and occasionally on foot but it’s by far most impressive from the air. It’s expensive, but you can’t come to the Big Island without taking a helicopter over Volcano National Park. I usually fly with Blue Hawaiian. You can book a flight with them out of Hilo here. 4. Star gaze atop Mauna Kea. At 14,000 ft., Mauna Kea has one of the best observatories in the world. Plan a trip up for sunset and be sure to pack plenty of warm clothes! 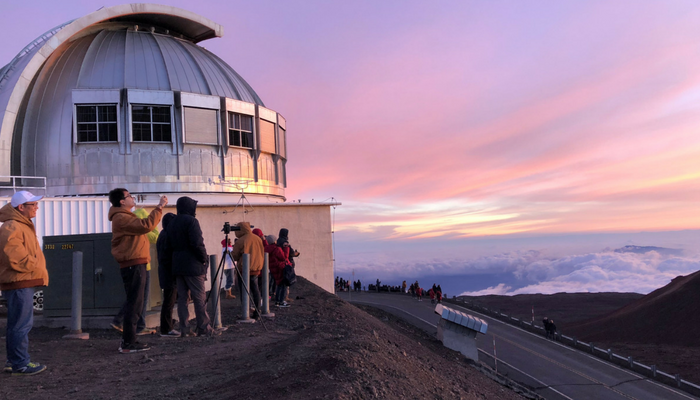 If you want to go all the way to the summit for sunset, you’ll probably want to book a tour (the road requires 4WD) which also includes dinner and star gazing at the visitors center. Read all about my experience at Mauna Kea here. 5. Visit Punalu’u black sand beach. 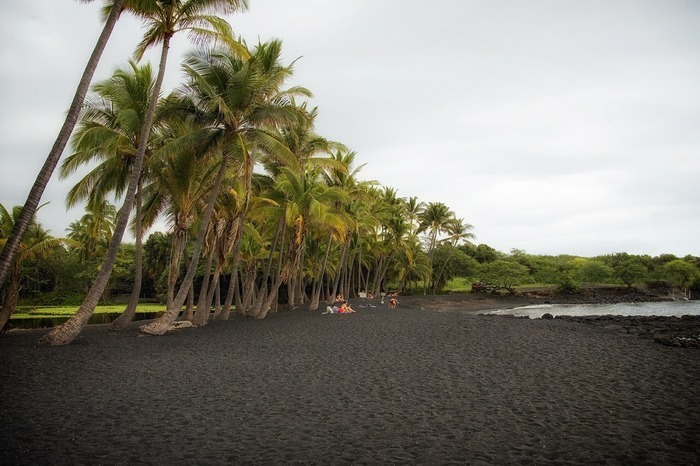 Hawaii’s most famous black sand beach is a sight that you shouldn’t miss. This rare phenomenon is created when molten lava meets the cool ocean water. 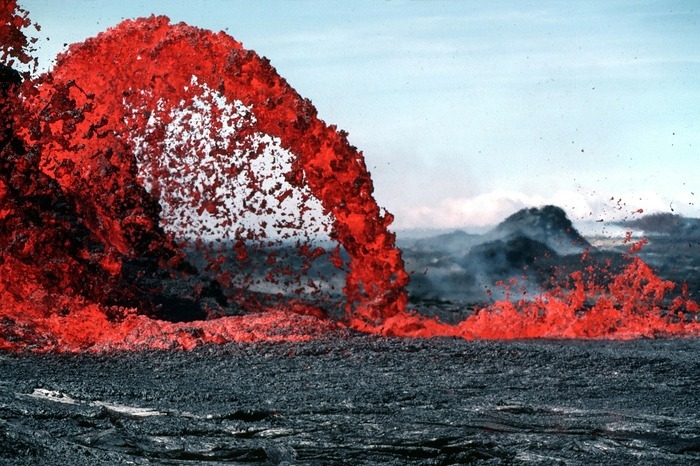 The lava shatters on impact creating the black sand. Sea turtles can often be found here. 6. 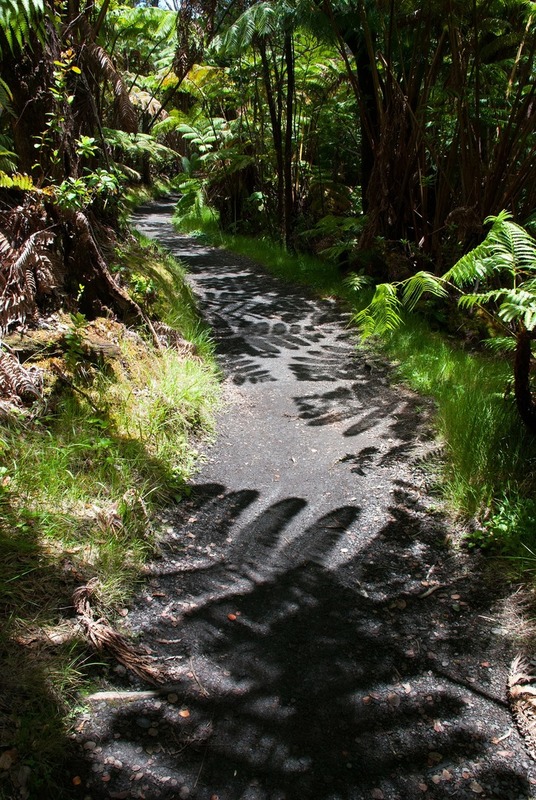 Take a guided hike to see lava flow. Nothing beats standing feet away from a live lava flow. 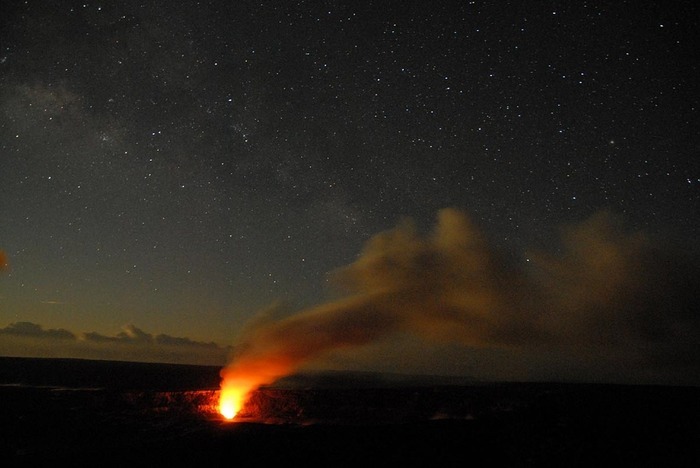 Book this tour for a guided hike as close to the lava flow as it’s safe to be. These tours are dependent on a variety of conditions though so it’s not always possible to hike to the lava flow, but if it is, your guides will get you there. 7. Tour a coffee plantation in Kona. Kona coffee is famous so of course touring a coffee plantation is on our list. There’s plenty to choose from on the Kona side of the island and the best ones will have tasting rooms where you can purchase coffee to take back as souvenirs. Wish you had a go to resource for the best spots in Hawaii? I’m talking snorkeling spots, trailheads, hidden beaches, local restaurants, and more! Sign up for my newsletter to access to my library of Hawaii Google Maps. I’ll also send you the latest and greatest Hawaii news, brand new things to do, special weekly deals and more. You don’t want to miss out on this! So sign up below! RELATED: Not very familiar with the Big Island? Read up on the lay of the (is)land and my favorite beach resorts, budget hotels, Airbnbs, honeymoon resorts, family friendly resorts, luxury resorts, and boutique hotels. 8. Hike through a fern valley and lava tube at Volcano National Park. There’s plenty to see at Volcano National Park besides lava. Take a hike through a fern valley to the lava tube and you’ll feel like you’re in Jurassic Park. 9. Explore Hilo town. Hilo is one of Hawaii’s prettiest towns and if it weren’t for all the rain it gets it might have rivaled Honolulu for the state’s capital. This sizeable town is perfect for exploring with plenty of shops and restaurants to easily occupy a day. Here are 25 things to do in Hilo. 10. Snorkel at Kealakekua. One of the Big Island’s best snorkel spots also happens to be where Captain Cook first landed when he came to Hawaii in the 1700s. Try a kayaking and snorkeling excursion with this company. 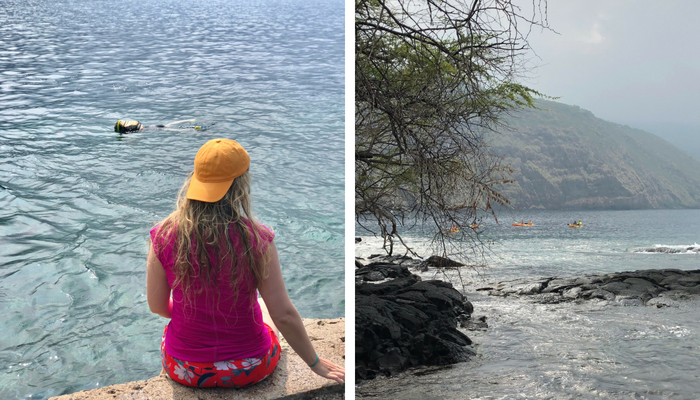 Read about my experience kayaking to and snorkeling at Kealakekua Bay here. 11. Visit Pu’uhonua O Honaunau, or the City of Refuge. A sight with a lot of historical significance for Hawaiians, the City of Refuge has a beautiful setting with some great beaches. The walled city itself is one of the only place left where you’ll find authentic tiki statues. 12. Spend the day at Hapuna beach. 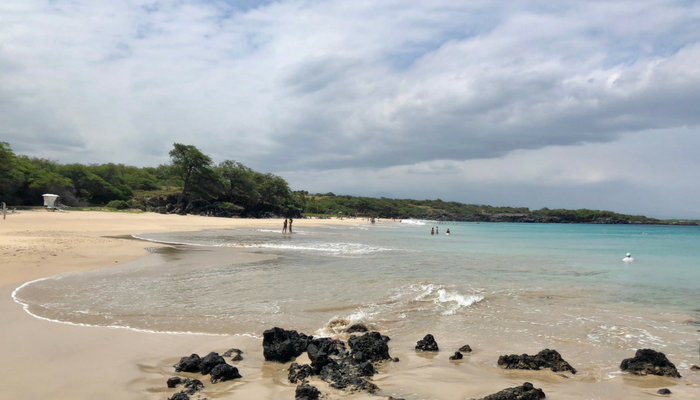 Hapuna is one of the best overall beaches on the Big Island and it’s the perfect place to spend a day lounging on the white sand, swimming in the crystal clear water, boogie boarding in the waves, or beach combing for treasures. 13. Night dive with manta rays. Diving with manta rays is an experience that’s unique to the Big Island (none of the other Hawaiian Islands offer this) and there are several companies that lead excursions out nightly. If you’re not a diver, book this snorkel trip to see the rays. 14. Hike to Akaka falls. Akaka is Hawaii’s most famous waterfall and it’s located right outside of Hilo town. 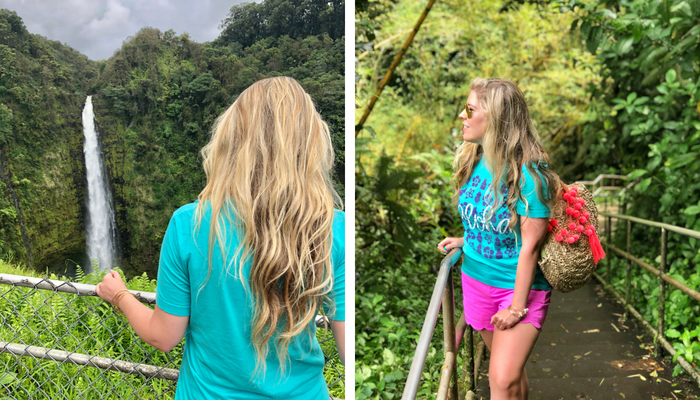 A hike through a lush tropical rainforest with ferns, orchids, and bamboo will lead you to the 400 foot Akaka falls. RELATED: Need a packing list for the Big Island? Find my best packing advice here. 15. Explore Waipi’o Valley. 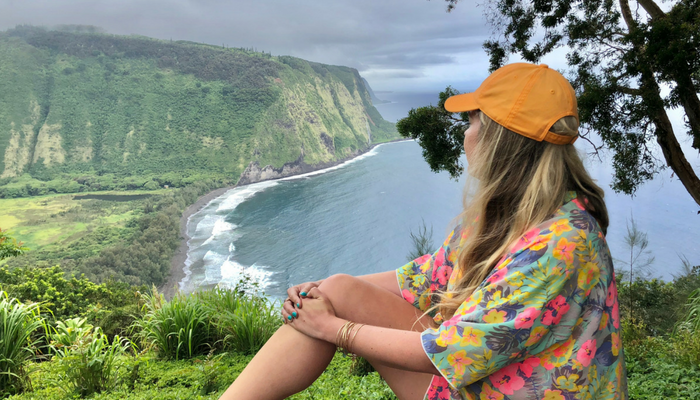 Waipi’o Valley is one of the most beautiful places on the Big Island but to experience it you’ll probably need to take a guided tour (steep four wheel drive roads keep most tourists from visiting). The tallest waterfall on the island can be found here and the lush and tropical setting will keep you oohing and aahing. Heading to another island? 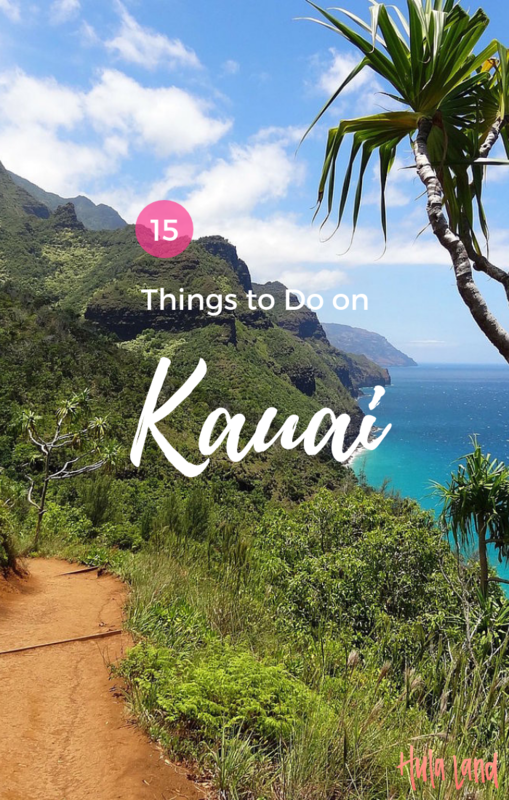 Check out my favorites for Maui, Oahu, and Kauai. Feeling a little overwhelmed with trying to plan the perfect Big Island itinerary? I’ve got just the thing for you! Big Island Bound! 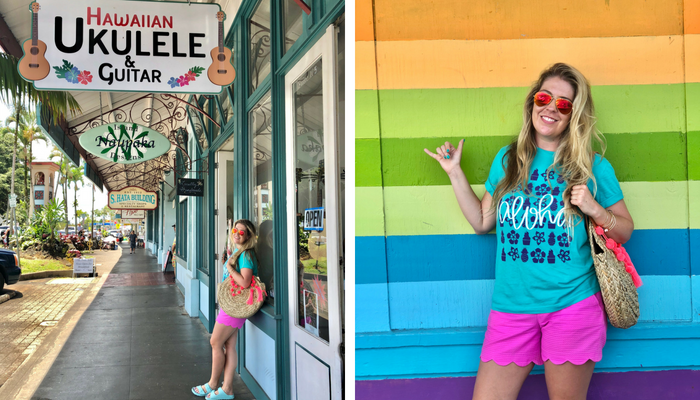 I’ve put together the BEST Big Island itineraries you’ll find anywhere! These are the itineraries I use on my trips to the Big Island (plus a few tweaks because hindsight is 20/20 right?) and they’re perfect for first time and repeat visitors who want to see the very best of the Big Island. I’ve included everything from the best snorkeling spots, beaches, and excursions and it’s all broken down by each part of the island so you won’t waste any time backtracking. So what exactly do you get? 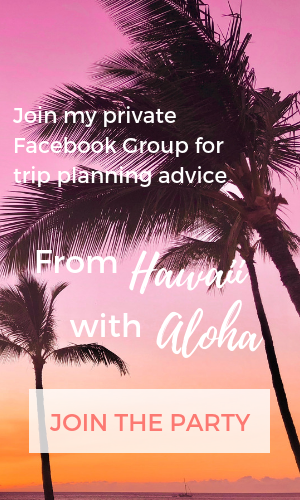 With Big Island Bound, you’ll get FOUR six day itineraries: 1) classic Big Island itinerary, 2) Big Island honeymoon itinerary, 3) Big Island for adventure seekers itinerary, and 4) Big Island foodie itinerary. I’m not just talking about a bullet point list of to dos. Each itinerary comes with 10-15 pages of commentary explaining why I recommend doing certain things (plus various options to suit your interests). Each itinerary also comes with its own Google Map (broken down by day). 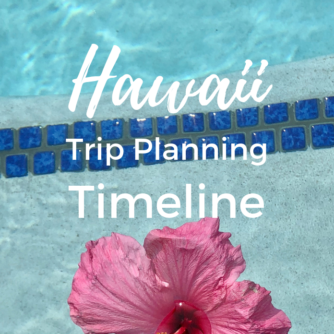 You’ll also get an itinerary template that you can use to make your own, along with extensive tips on creating your own itinerary, a huge list of things to do on the Big Island, and directions for making your own Google Maps. This is basically vacation in a box, friend! Just add a bit of salt water and you’re in for the trip of a lifetime! Click here to grab the Big Island Bound itinerary bundle. Aloha! 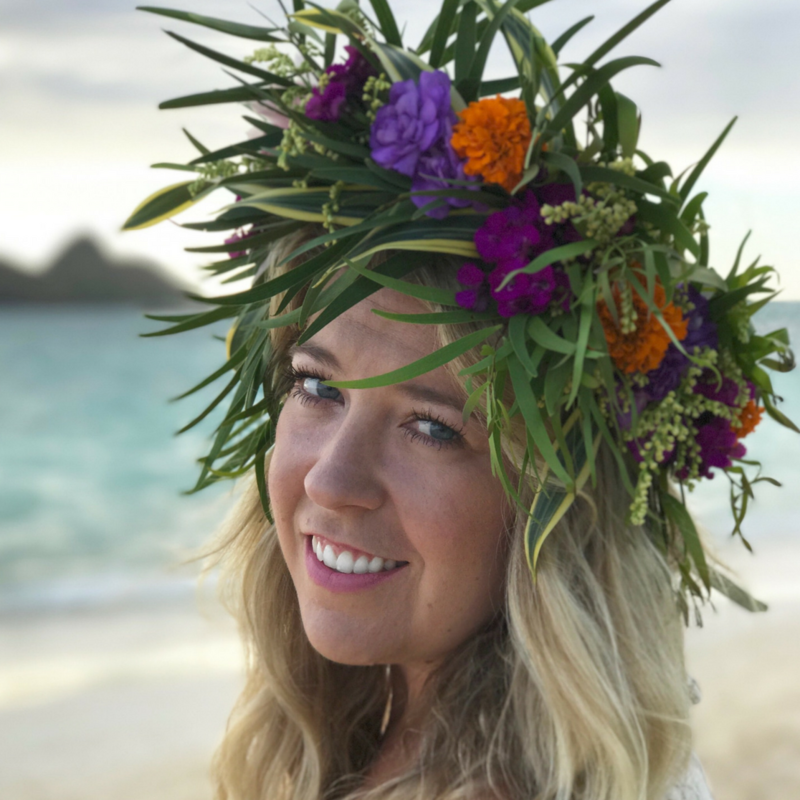 I’m Cate…Hawaii lover, wannabe mermaid, beach bum extraordinaire, sand castle architect and firm believer that beach days are the best days! Follow my adventures around the world one beach at a time. Visit Hulaland | Beach & Travel Blog's profile on Pinterest.